There are so many decor changes that you will want to make in a new build. Every change usually requires you to spend money, so we upgrade on fixed items that we do not want to change later. With open floor plans where the kitchen is open to other spaces in the home I think It is a good idea to spend on upgrades on the kitchen. In our particular model The Alexander the three main rooms are open to one another. I am happy that eQ Homes deals with Deslaurier Kitchens. They have a nice selection and great products to choose from. I definitely want a more contemporary style with this home. The trim and doors of a home can influence the interior style. Upgrading the trim and doors is a good choice to make. Changing the trim afterwards is a lot of work. I love the look of wider planks for the floor, but I stuck with a standard oak floor but upgraded on the stain. Although eQ Homes has popular Sherwin Williams colours to choose from I splurged on upgrading to Rhinestone from Sherwin Williams. I enjoy choosing my own style of lighting. Having keyless light fixtures in the bathroom allows you to do that. EQ Homes does not charge for keyless light fixtures which is great. Another item worth mentioning is the upgrade to high density underpad for the carpet. I have to admit we are a little picky when it comes to a new build. Okay maybe a lot picky. There are some things in a new build that excites Scott (okay that sounds strange) but it is true! Scott is an Aerospace engineer who just happens to be a qualified home inspector too! I guess the whole combination makes him just a little particular. Here are a few things he really likes in a new build. Flat ceilings make such a huge difference. eQ Homes now offers flat ceilings as a standard feature. Architectural Shingles are nicer that standard shingles and we are glad that they are standard for eQ Homes. Coloured window frames. Having window frames that compliment your brick or stone is nice to have and looks better than white. Large windows and lots of them. 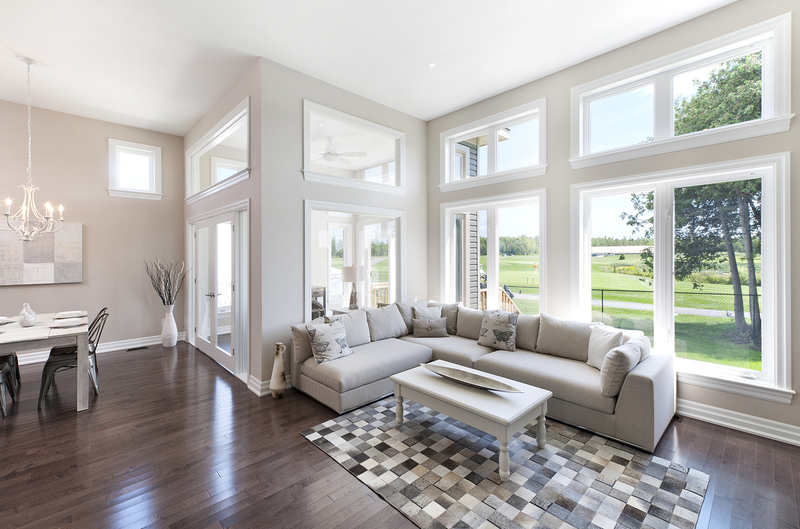 eQ Homes has great almost floor to ceiling windows in their Alexander model. Some other features that Scott likes include the auto close mechanism that is built into the hinge of the garage door. The house is sheeted with OSB that has rigid foam insulation that adds extra R value to the walls, they cut control joints into the basement concrete slab, and install oversized egress windows. 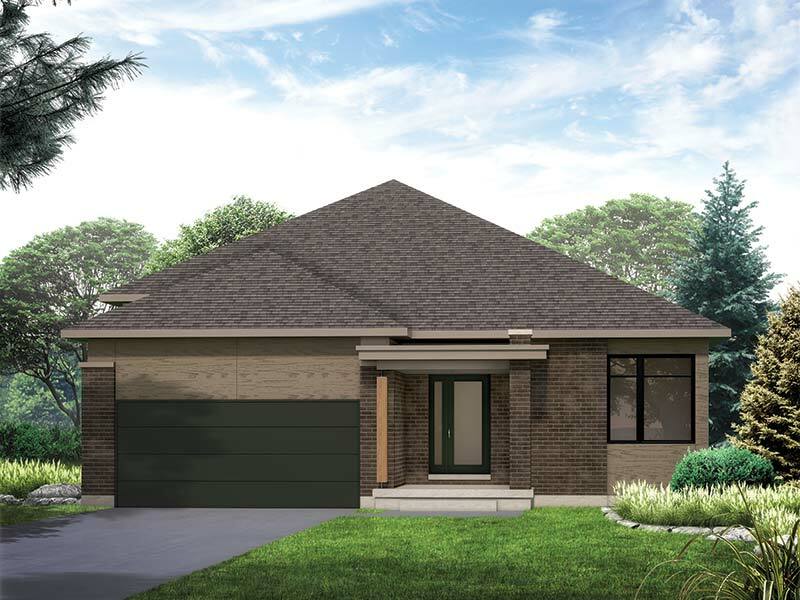 Here is a look at the Alexander from eQ Homes. Design team Marc Lalonde, Carol Anne Tippins, Stephane Dazé. 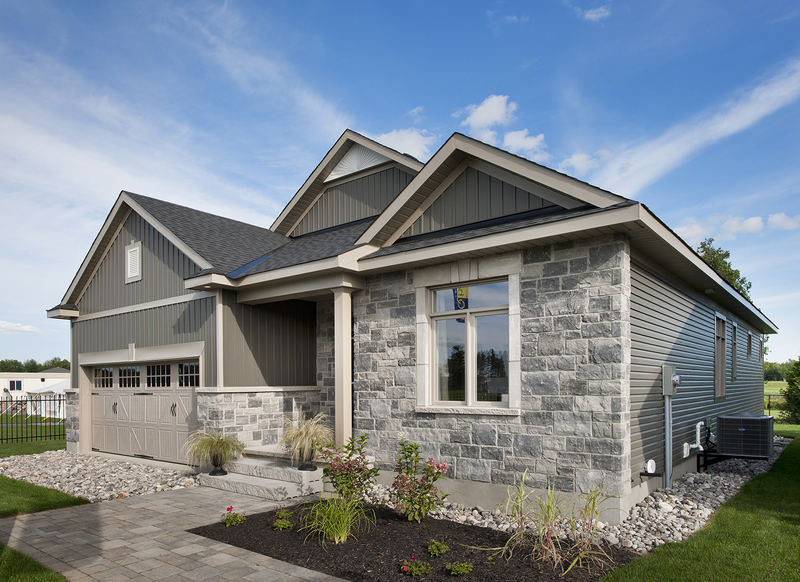 EQ Homes allows home buyers to choose one paint colour from Sherwin Williams paint collection. I love blue so deciding on a paint colour with blue undertones from Sherwin Williams was were I was heading. Our home will be south facing, so we will get plenty of light. I still prefer lighter walls so I finally decided on Rhinestone from Sherwin Williams. With fantastic large sized windows I think Rhinestone is the perfect backdrop for a slightly west coast feel. I also chose a standard oak floor and we paid extra for the stain that we wanted. I wanted wider planks but it was too expensive. Our floors will provide some warmth since there is an abundance of white cabinetry and light walls. The one negative is the hardwood manufacture that eQ Homes deals with does not provide flush vents. Well, they do but they are not manufactured finished flush vents. The cost of a vent was pretty much astronomical for them to finish and install. I think the quote was around $160.00 per vent. So, this means that Scott will be buying the vents, staining them and installing them. There is always work even if you buy a new build! Take a look at the photo featuring Rhinestone from Sherwin Williams right below! When you buy a new build one of the first things that you will review and be required to make decisions on are the structural changes. Some items that you may want will cost thousands of dollars. 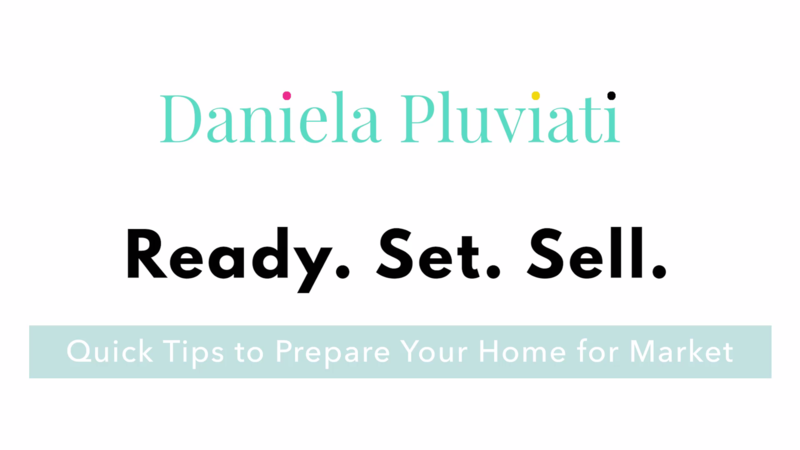 When you begin making decisions on extras for your home it is important to have a budget. Items quickly add up if you are not careful. When Scott and I signed (with the wonderful Marissa) eQhomes had a decor bonus which helped. Below are some structural changes that we think are worth paying for. If you want a bedroom in the basement you will need two ways of egress. Your bedroom must also have a window. The square footage of the bedroom dictates the size of the window required. The size of the window depends on the building code of your area. We decided on two larger egress windows for our basement as we like extra light. If you want a bathroom in the future it is worth spending the money on a three piece bathroom rough- in. eQhomes does not provide this so the rough- in was extra. If you have extra cash and you do not want jack posts in your basement then paying for a beam is something you should consider. I always love basements that do not have posts right in the middle of the room. You can work around jack posts of course, but its just nice not to have them! One structural change that we have made in the past and are glad we did was omit the living room. Shifting a wall or adding a wall for an office makes more sense to me. Does anybody ever use their living room now? A few other items that are not structural but worth mentioning. I personally prefer garage doors without handles. It gives a home a cleaner look. We always request that door handles not be put on. Bonus: eQhomes provides pot lights in the soffit which I think is great! We are moving……again. Our next home will be in Kemptville. 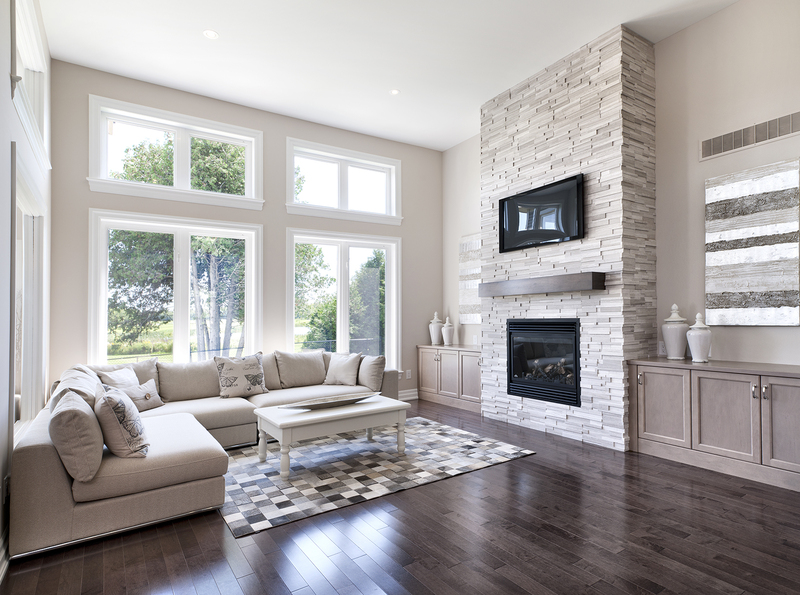 EQ Homes in Kemptville seems to have it all. An award winning golf course, a clubhouse with a work out facility and a pool. There are also plenty of bike trails and amazing paths that interlink with one another. Perfect for enjoying life outdoors! Choosing a bungalow was an easy choice as we presently live in one and we love the lifestyle a bungalow offers. Choosing the floor plan was not at easy. We eventually decided on the Alexander with the sun room. 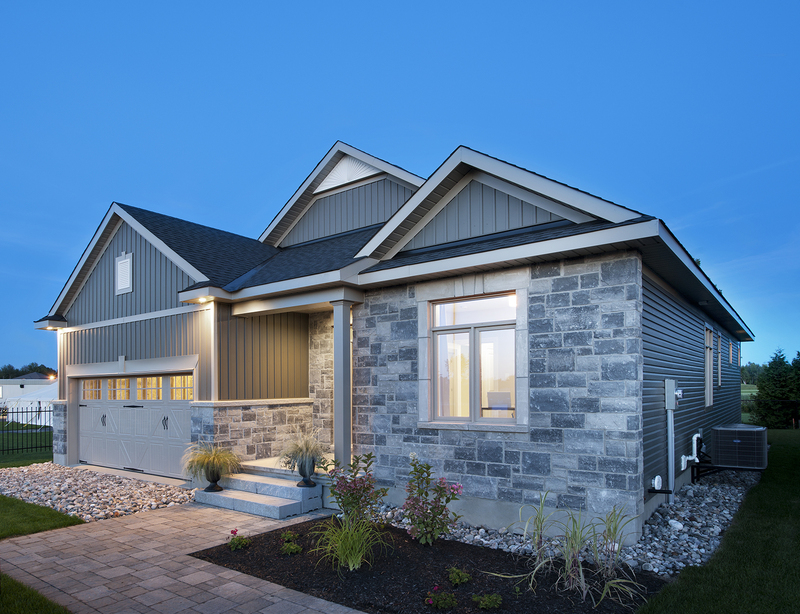 Ottawa builders have come a long way and have many contemporary models to choose from now. The Alexander model has an abundance of windows which I love. The windows are almost floor to ceiling which is great for a south facing home. We previously walked through a few Teron built bungalows in Beaverbrook only to be disappointed to see the homes renovated a different style (not mid-century modern). Many of the original features were not there any more. We stopped looking in Beaverbrook about a year ago and decided on Kemptville. Choose wisely when deciding on a material/colour package for a new build. We chose a neutral palette for our exterior that will stand the test of time.